PTSD: A Guide to the Basics :: Unstuck Living Pro! Want to spread the word about how you can help your clients with symptoms of PTSD? 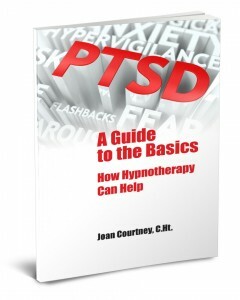 This book is written to educate the general public on how hypnotherapy can assist to reduce PTSD. Symptoms helped include anxiety, phobic responses, panic attacks, hypervigilance, nightmares, insomnia, grief, regret, emotional numbness, low self-esteem and more. Use this as a marketing tool to gain entrance to your potential clients. Post Traumatic Stress Disorder (PTSD) is a term bandied about, usually focused on wartime experiences of veterans and those in the armed forces. But what about those being flooded out in the Southeast, experiencing earthquakes in California, watching fires race quickly downhill in the Southwest or even reliving the terror of 9/11 through the media? PTSD affects not only those experiencing floods, fires, tornados, earthquakes and hurricanes, but includes victims of car accidents, robberies, fear of nuclear disaster, physical and sexual abuse and much more. In What Areas Can Hypnotherapy Help? Stressed Out? Or in Control?